Mon., Aug. 13, 2018, 10:30 a.m.
For five years, lawmakers in Olympia grappled over how to comply with a state Supreme Court order to adequately fund education. Now that a nearly $1 billion court-approved funding package is being distributed to school districts in the Yakima Valley and the rest of the state, disputes are breaking out over how much should go to pay raises and how much should be spent on programs and services. Teachers and other employees in the tiny North River School District in rural Pacific County got an average 34 percent pay hike. Othello gave an average of 17 percent. Meanwhile, the Yakima School District is offering employees an average of 3.3 percent, while Selah at one time offered 3.1 percent. Don’t look to Olympia for clarity. Lawmakers who passed the spending package disagree over how the funding is intended to be spent. The confusion has frustrated no less than State Superintendent of Public Instruction Chris Reykdal. “What is clear to me is that you do not all agree on what you passed or what was meant by one aspect of a policy or another,” he wrote last month in an open letter to the Legislature. 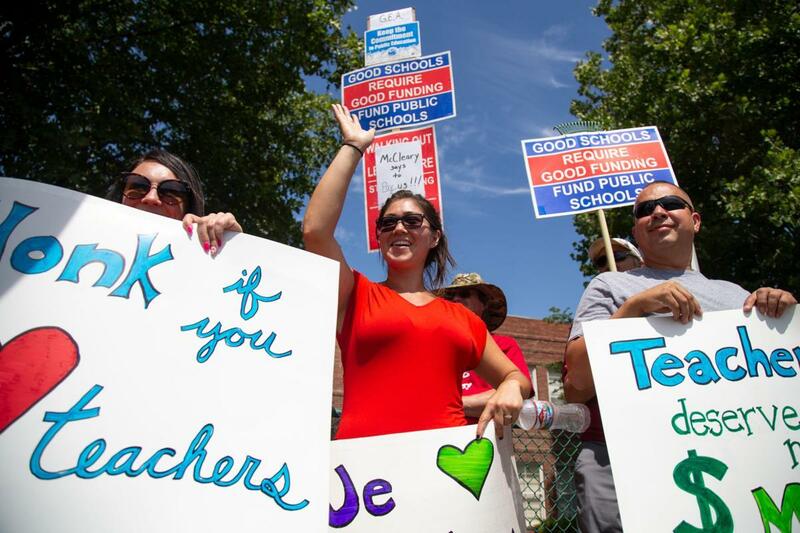 Throughout Washington, school employees who haven’t received double-digit windfalls are fighting with administrators. Since mid-July, hundreds of employees from Yakima Valley districts have held at least seven rallies calling for better pay increases. Without significant increases, employees say higher-paying districts will lure staff away. What’s more, the Legislature is giving additional dollars to districts for salaries, they argue. “If the money is for salaries, why should we have to fight about it?” said Steve McKenna, the president of the Yakima School District employee union. On the other side of the table, administrators say their problem is that lawmakers attached strings to most of the additional dollars and limited how much districts can raise from local levies. Employees see districts receiving huge windfalls and wonder why they aren’t offering better raises; but districts say they don’t have control of all the money they’re getting – some of it has to be allocated elsewhere. And, the money that districts can control, administrators say, must be divided between salaries and programs that will be underfunded because of the cap on local levies. Those programs range from classroom supplies to school safety officers. Contradictory statements on the issue from state lawmakers are sowing confusion among local administrators and their employees. “They gave us a pot of money that some legislators are saying is for salaries; but I think you’ll find that, even among legislators throughout the state, there’s different understandings of the use of that money,” Backlund said. State Rep. Bruce Chandler, R-Granger, said this idea that districts need to allocate all the new funds to employee salaries is just one interpretation of the court’s order in what’s called the McCleary decision. Rep. David Taylor, R-Moxee, said employees shouldn’t expect to get every dollar in additional funds their districts are receiving. He also blamed the Washington Education Association – the state’s largest representative of school district employees – for fueling unrealistic expectations. “I had some folks send me some of their fliers and information they were sending to their members, and they were calling for double-digit pay increases in bargaining without acknowledging that the (plan) itself put limits on what school districts could bargain,” he said. However, legislators in other areas of the state have taken opposite positions, saying employees should get the money they allocated to districts for salaries. “I think the Legislature’s intent related to fully funding education is putting the money toward that which the court has said it needs to go to, which is salaries. I would expect that local districts are going to be honoring that requirement,” state Rep. Mike Pellicciotti, D-Federal Way, said in a video posted on the Washington Education Association’s website. In that same video, state Rep. Derek Stanford, D-Bothell, makes similar comments. “I believe we have to step up and meet the court’s mandate, and that’s about compensation,” he said. Despite their differences, local administrators and employees agree on one thing: These contradictions, coupled with a general lack of guidance from the Legislature, are only adding fuel to already fiery negotiations. Making matters worse, some districts are getting far larger raises compared to neighboring districts because of the way the system is set up. For example, districts in places where the cost of living is expensive or where base salaries were far lower than other districts will get more funds. Reykdal commented on how these issues will affect negotiations in his letter to the Legislature. The message from school district employees across the Valley is clear: Not only is the new money rightfully theirs, but they also deserve it. In districts where negotiations are contentious, employees say they’re being forced to consider heading to districts where they can make more money. At a rally in Toppenish last month, Kristen Turner, a teacher at Lincoln Elementary School in Toppenish, said she doesn’t blame those who want to leave the district, and said she’s thought about it herself. Moving to districts offering better salaries isn’t about greed, said McKenna, the president of the Yakima School District employee union. Some employees do it simply because they need the money, he said. Employees say the bottom line is that the Legislature’s intent for local administrators was to spend the funding on salaries. “The real issue is the districts are getting the money they’ve always gotten, but they’re also getting additional (dollars) to continue to fund salaries and salary increases,” said Tammie Carr, the president of the Grandview School District employee union. By not doing that adequately, she said, districts are primarily responsible for the contention in contract negotiations and can’t shift the blame to others. Apart from receiving more money for salaries, many districts are getting additional funds solely dedicated to programs for students who are struggling academically. Selah Superintendent Backlund said that adds to the controversy because many employees don’t realize the district doesn’t have control over all the additional dollars its getting. Yakima School District Superintendent Jack Irion echoed Backlund. As for the additional funds districts do control, administrators say deciding how to allocate them is tricky. They need to offer teachers more money, but they must also ensure certain programs remain funded over the next few years – especially since districts will soon be limited in how much revenue they can raise in local property-tax levies. For example, the Selah School District’s levy generates roughly $3.50 per $1,000 of assessed property. But under the Legislature’s decree, all local levies will be capped at $1.50 in 2019. With its levy revenue cut by more than half next year, the district will need to find new ways to pay for such things as school resource officers and computers, which the levy dollars helped pay for in the past. “If we give all those dollars to employee salaries, then we wouldn’t be able to pay for some of the things that are vital to the operation of our district,” Backlund said. This problem isn’t unique to Selah. Administrators in the Grandview School District also say the levy cap will cost them millions of dollars over the next few years. Simply put, administrators say the situation they’re in is more complex than many realize. They agree their employees are hard-working and deserve fair compensation, but say they can’t afford to give them the raises being sought in many cases. Like other administrators and education officials, Irion blamed the Legislature for creating the turmoil. Published: Aug. 13, 2018, 10:30 a.m.